It's tax time again! (Boo!) We're always looking for some way of making our lives easier and goodness knows the calendar pages flip quickly to tax time. I put together this excel workbook to hopefully help others selling on Etsy. 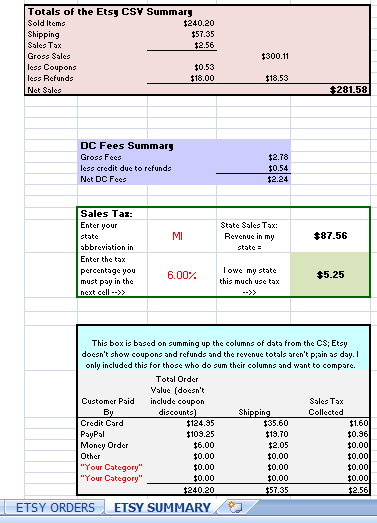 The spreadsheet will break the data into usable information regarding sales, shipping, tax and I even included a little calculator to help others that have to pay their use tax for sales in their own state. Download the 2010 excel file .XLXS file. I'm not sure of the best file type so I made 3 versions available. If it doesn't work, email me and I'll send you the file! DetroitKnitter@Gmail.com. Now we need to get your CSV into the Order sheet. For this you will need to download the CVS for the year from Etsy. To get to the download page go to "options" on the left side bar then click the "Download Data" tab. Go ahead and select "orders" from the CSV drop down box and only select 2012 then click the "Download CSV" button. Don't forget where you saved the file! Open the file you just saved. Click your mouse on the number 1 on the left side and the entire row is highlighted. Click and drag your mouse all the way from the top row to the bottom row so that the entire row of data is highlighted. 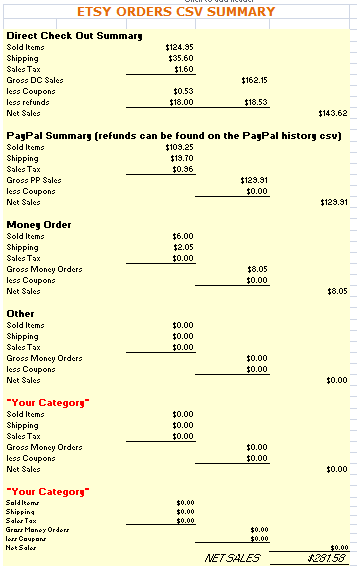 Go to the my Etsy CSV Summary worksheet and on the Orders tab you will click the top left 1 highlighting that row then. Right click. "Insert Copied Cells"
If your sheet still had data on it, just click and drab over it and delete it; you'll have to go back to the downloaded data and stat the copy/insert over again. The SUMMARY page will incorporate your personal data. I do hope this information proves useful!! !